I’m not going to lie, I order a lot of stuff online and I tend to make small, frequent orders of random items as and when I need them. Sharpies, tiger balm, specialty tea bags, candles, sketch pads, fancy dress wigs….you get the picture. As a consumer, the obvious advantage is convenience. I don’t have to waste precious time traipsing around actual shops searching for what I want, but there’s an increasingly frustrating aspect of online shopping that’s driving me, and others potty. Now don’t get me wrong, requesting feedback from customers is a perfectly legitimate activity, and in a world where online reputation lives or dies on the strength of customer reviews, it’s a necessary marketing activity. But, and this is what really grinds my gears, just lately I feel like I’m drowning under an avalanche of requests in my inbox to take “just 5 minutes” of my time to fill in feedback forms or write online reviews. From review requests after buying a box of tea bags to “how are we doing?” requests for products I’ve not even received yet, I’m under an almost daily barrage of businesses begging me for feedback, and my time. As a marketing professional I clearly understand that feedback is important and valuable, but from a customer perspective, can it all just stop please? Like NOW? There are some big considered purchases and some purchasing experiences that are so good (or bad), that I feel compelled to write a review, but when it comes to a £1.50 USB cable or a £3.50 box of tea bags, are you kidding me? If I wrote reviews for all the random stuff I buy online, it would be a full-time job. OK, I exaggerate, but I have neither the time nor the inclination to invest precious time into writing reviews for each and every mundane item that I buy. Review apathy is a thing; a quick straw-poll in the office and a chat to some clients revealed others who feel the same way and are totally fed up with feedback requests. Sure, it’s an anecdotal claim, but I’m willing to bet that vast numbers of internet shoppers can identify with the issue, feeling at best apathy and at worst, annoyance towards the endless stream of feedback requests they are subjected to. The message to businesses? Let’s get a bit more intelligent about the instances and products we are asking customers to review. Contacting customers too frequently is a major annoyance, and alienating customers by hounding them for ‘just a few minutes of their time’ constantly is almost guaranteed to lose the engagement of regular customers. 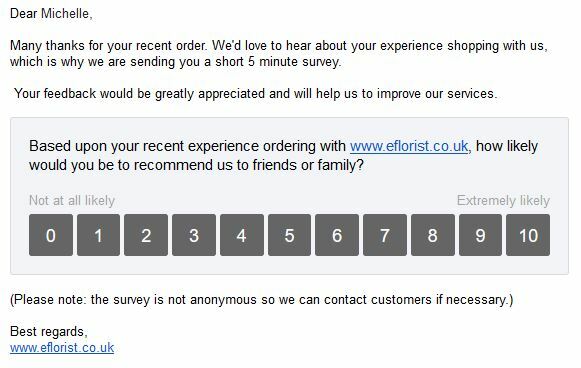 Whilst feedback requests are usually automatically generated, it’s no excuse for retailers not to apply at least a bit of logic. Will a customer who’s spent under a fiver really be willing to give up five minutes of their time to take photos and write a glowing review of a mundane product like a light bulb? For repeat customers, how about sending them occasional emails listing their recent purchases, asking them if they’d mind reviewing one. From a customer’s point of view, it reminds them just how many purchases they’ve made with you and allows them to select their favourite which they might just feel motivated enough to write about. Alternatively, try asking only new customers for reviews so you don’t annoy loyal customers, or flip that around and only ask for a review once someone has become a loyal customer, by asking only after they’ve made a repeat purchase. How about asking for feedback or reviews after every 3rd purchase, or on purchases only over a certain value? Finally, you could offer the incentive of a money-off voucher or entry into a free prize draw so your customers will feel more inclined to invest their time into leaving feedback and may feel less aggrieved if they feel they could be benefit. Whatever you do, it’s time to stop bombarding your customers and expecting them to give up their time. To break through review apathy, retailers need to get a bit smarter about how often and under what circumstances reviews and feedback are requested. If you need a hand with your email marketing, or any aspect of your digital marketing, our friendly team can help. Get in touch with us or find out more about our digital marketing services. Like it or loathe it, Black Friday is a big deal. With more retailers than ever offering Black Friday deals, we take a look at some of their landing pages and marketing tactics.